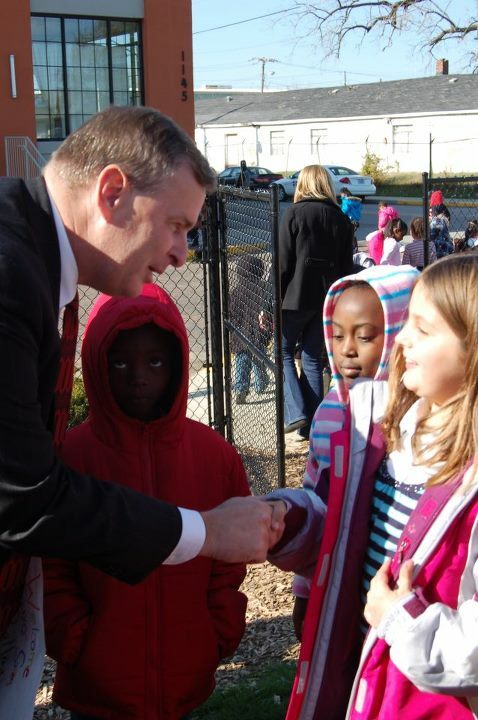 On July 17, Indianapolis mayor Greg Ballard announced he was closing The Project School, one of the few community-led charter schools in Indiana and the 2012 winner of NUVO’s Cultural Vision Award*. Blaming low test scores and financial problems, the mayor gave TPS officials only 15 days to respond and held no public meeting, besides a press conference, where the “official” narrative presented was quickly aped by local media. All of this appeared out of the blue. TPS’ leader, Tarrey Banks, in an email to the school’s community, says that last week Beth Bray, Ballard’s director of charter schools, emailed him and said not to “worry about” the school’s upcoming year plan, since in early fall the mayor’s office would meet with TPS’ board to discuss the school’s fourth year review. After a parent notified Banks that someone had heard the closing announced at a meeting, he called the mayor’s office, but was ignored. Bray finally emailed TPS about revoking its charter at 4:45 that day, while Jason Kloth, deputy mayor, was holding the press conference. All of this has outraged parents, students, and teachers. With only a few weeks before classes are set to start, there is no time for TPS to find another of the many authorizers in Indiana to grant the school a new charter. As a hands-on learning center, TPS is unique, and its board of directors is even more unique, for it, unlike the majority of Indianapolis charter schools, does not contain corporate members or cronies of the Indiana corporate school complex. Annarino is referring to another of the mayor’s complaints about TPS–its low test scores, which has seldom factored into the chartering of other schools in Indianapolis. Harris is right. Standardized tests are the weapons of mass mis-instruction. They profit companies who often have political ties to lawmakers, like Pearson†, the educational mega-company, which has made a killing off of grading standardized tests since NCLB became law, along with Libyan dictator Muammar Gaddafi who owned a $453 million stake in Pearson. McGraw-Hill, publishers of Indiana’s textbooks and ISTEP tests, are long-standing friends with the Bush Family, and even George W. Bush’s brother Neil has profited. Standardized tests are also being used as a ruse to deem schools “failing” so they can be turned over to for-profit educational management outfits, who more times than not also have political ties to any given region. These tests, which supposedly hold teachers “accountable,” are meant to drive well-qualified teachers out of the workforce, so they can be replaced with temporary Teach for America or Teach Plus workers (both groups are in Indianapolis), before these temps fly off to their jobs on Wall Street. Indiana will spend $46 million this year on testing and remediation, says Dr. Vic Smith in a May 12, 2011 memo entitled Observations on Education Items in the 2011 Budget, which has been circulated among public school advocates. Ballard’s closing of TPS is drawing the ire from national groups and leaders who see standardized testings as not only a waste of tax money but of the minds of children. The heart of TPS is equity. Students are “part” of the school like nowhere else. The students propel the lessons and what direction they go in. The community sets the tone for the year via the Curricular Summit. Students are taught Heart/Mind/Voice is the key to total and whole growth. Along the way they have had incredible exposures to and chances to learn from and work with the Downtown Indianapolis community non-profits, residents and businesses. And I believe, as a small business owner in Indy that the kids have impacted the community as much as it impacts them. Plain and simple, as a community-led charter school meant to fulfill what the original creators of the charter school idea envisioned, TPS doesn’t fit into what corporatists want for Indianapolis and all cities across the U.S.
Everyone who dreams of fulfilling the myth of the American dream worships Bill Gates, even though he holds no college degrees, grew up wealthy, allegedly stole many of his software ideas from researchers, and uses government tax breaks to build his empire. From the Common Core to the common cold, Bill Gates has his money (which he doesn’t pay in taxes) in it. Bill Gates didn’t invent corporate school reform either, but a lot of people are taking his money and fulfilling his dream in Indianapolis. The Center of Excellence in Leadership of Learning (CELL) at the University of Indianapolis is a good example. CELL has received $13.6 million from Bill Gates in recent years and is a leading university promoting the corporate school model in Indiana. Gates’ foundation funds Mitch Daniels’ Education Roundtable, the Mind Trust’s CEE-Trust, the Diploma Plus program, Teach Plus, and the New Teacher Project, all part of the Indiana corporate school complex. Gates also gives money to Stand for Children, the anti-teacher front-group the Mind Trust imported to Indiana and which Gates, the Joyce Foundation (also involved in Indy), and Advance Illinois helped buy out Democrats to pass laws against teachers. The Mind Trust is now pushing Gates’ plan to extend online-based charter schools across the U.S, ones similar to the six just approved for Indy which are owned by former Mind Trust fellow, Earl Martin Phalen. The whole purpose of these schools is to hire three or four teachers who teach half-time, while low-paid workers watch kids play videogames for the rest of the school day, which saves the CEOs of the schools money for their own pockets. Patrick: I am eager to see applicants to my Charter School Incubator (The Mind Trust) to consider this kind of next gen model, but my fear is that if I add this to my website, then I am signaling to applicants that we have a strict preference for next gen school models. Patrick: With $1 million on the line for each award, I don’t want to send inaccurate signals! Patrick: That is a clever point. We are doing that exactly, and I wonder if it will necessarily point people toward next gen models. Patrick: We agree that we want charter schools that are sustainable on public dollars, and next gen may be the only way to do that. Indy deputy mayor Jason Kloth likes this corporate approach. In 2010, while working for the temp-teacher Teach for America, Kloth praised the Mind Trust and CEE-Trust, telling the Chronicle of Philanthropy that he wished there were more David Harrises in the world. Kloth, Beth Bray, charter school chief, and “trustees” Angela Smith-Jones and Robert Vane appeared recently on Amos Brown’s Indy radio show. Kloth has been playing a small part in the corporate school movement in the city for some time now. When Superintendent of Public Instruction Tony Bennett’s wife, Tina, was employed with Teach for America, which funded Marian University’s “Turnaround Leadership Academy” to the tune of $500,000, Kloth–along with Eli Lilly’s Rob Smith, Ryan Olson of the Project Lead The Way-funding conservative Kerns Family Foundation, charter school leader Charles Schlegel, and IDOE’s Dale Chu–was listed as a consultant to the program, which was to be “assessed” by the Sagamore Institute, a right-wing pseudo research group. Although, to his credit, Amos Brown has been leery of both IPS leadership and the Mind Trust’s “Opportunity Schools” plan, he, nonetheless, has offered, on his radio show, the microphone to many corporate school promoters: Teach for American people, Tindley leaders, Jeb Bush friends, and Black Alliance for Educational Options/Democrats for Education Reform’s Kevin Chavous. Black Alliance for Educational Option’s current president, Kenneth Campbell, who made $102,000 (not counting other compensation—see page 9 here) in 2010, appeared on Amos with Marc Lotter from Ballard’s office last year. The Black Alliance for Educational Options (BAEO) is a Walton family (owners of Walmart) front-group employed over the years by the rightwing rich who are anti-affirmative action and use young black kids as pawns in their ploys to turn schools into profitable little Walmarts across the country, so that mom-and-pop schools like TPS are swallowed whole. The Walton family not only funds Campbell and crew, it is a major part of the Indiana corporate school complex. According to its website, the Walton Family Foundation, in 2011, funded the following groups active in one way or another in Indianapolis: BAEO ($796,000), Alliance for School Choice ($1,202,000), the Mind Trust ($500,000), the Mind Trust’s Andy Rotherham’s Bellwether Education Partners ($90,000), Friedman Foundation ($565,000), School Choice Indiana ($200,000), and even the Indiana Department of Education ($25,000). Recently, Alice Walton, heir to the Walmart money, gave Tony Bennett the largest donation to his campaign to date: $200,000. A recent Alternet article claims that the Walton family has as much wealth as 48 million Americans combined. The Walton family has even donated $1.3 million to help fund Ballard-supported charter schools in Indianapolis. Some of the $11,500 Walmart money the mayor dished out in May 2011 went to Indiana University Health so the mega healthcare provider could “explore” starting its own charter school franchise; some went to Ballard’s old school, the Cathedral High School, which was already using Mind Trust money through a partnership with Seton Education Partners. One caller to Amos’ show once worked for the Walmart-funded BAEO in Indiana. In 2002, Barato Britt abandoned his post with the charter school operator GEO Foundation to join BAEO. This revolving door tactic should come as no surprise since BAEO was heavily funded by the American Education Reform Council when Kevin Teasley (GEO’s leader) worked for AERC in 1997. Besides scripting school-reform propaganda for the Indianapolis Recorder and the Heartland Institute (which cheered for the Indiana Parent Trigger Law with ALEC), Britt fronted the Edna Martin Christian Center, a position he appears to still be using to conceal his anti-public education agenda. As board member and 2002 co-founder of Irving Community School, a charter in Indianapolis, Britt has set up an anti-public education killer team that still is in operation today. Board members include Jeffrey Lozer, a former Ice Miller corporate attorney, past community relations assistant secretary to the charter-operator Christel DeHaan Family Foundation, and previous vice president for DeHaan’s Resort Condominiums International. Along with Jeffrey Lozer, Arabic specialist Jennifer Suzanne Thuma is or was involved with Irving. She is a former legislative director to Governor Mitch Daniels and was education coordinator to the Indiana General Assembly from 2009 to 2010. Milton Friedman’s Foundation for Educational Choice member Leslie Davis Hiner and Indiana Christian songwriter Michael Welch also join Barato on the Irving Community School board. Amos, unfortunately, was quick to cut off and criticize Brandon Cosby, whose son attends the Project School. Cosby, by telephone, mentioned how Ballard’s office completely ignored the financial problems at the Stonegate Early College High School, where Cosby’s wife used to work. In fact, the school was so financially in shambles that the school’s board, not the mayor’s office, closed it. But Stonegate was very good at following the Indy corporate school model of : funneling money to friends. In fact, The Precedent Companies, the Peterson family real estate development firm Bart headed before becoming mayor, was hired to renovate the new Stonegate school. Formerly known as the Lawrence Early College High School, Precedent was paid over $664,000 (noted on page 8 of the 2009 990s) for its work at the charter school. As I recently pointed out at NUVO, Peterson and his Mind Trust have no problem with faulty and suspicious financials of the charter schools run by their associates, ones representing corporate profit. Case in point is the then-mayor Peterson-approved Challenge Foundation Academy Indy, whose board includes two members of Strategic Capital Partners, a national real estate and investment firm Peterson worked for after he lost his re-election bid. The charter school is operated and funded by the Challenge Foundation, an anti-climate change promoter and libertarian outfit started in Texas in 1989, which has lavished millions of dollars to over 182 charter schools across the U.S. and is led by Georgia Gulf Corporation’s John D. Bryan, a heavy Scott Walker donor and Koch Brothers acquaintance. In what looks like a scratch-your-back-moment, in 2008 the Challenge Foundation handed Peterson’s Mind Trust $486,400 to support its education fellowships given to Challenge Foundation Fellows. The Charles A. Tindley Academy is the darling of mayor Ballard, former mayor Bart Peterson, and even Bill Gates-funded Education Nation, hosted by Mind Trust board member Jane Pauley’s former network, NBC. When just a rookie Teach Plus teacher, James Larson, who now runs Tony Bennett’s charter school turnaround department, appeared on the corporate ed. show where he met with Brian Williams, who, as a member of the Robin Hood Foundation, is in the thick of hedge fund managers’ attempts to charterize New York City. Like KIPP and Edison Schools (before it was exposed as a sham), Tindley is the poster child of those who seek to profit from public schools. What separates Tindley from the Project School? Corporate money, plain and simple. Not only does Tindley partner with the Greater Indianapolis Chamber of Commerce, it takes money from one of Bart Peterson’s favorite rightwing foundations, the Challenge Foundation. It also takes loans from Peterson’s friend Darell Gene Zink. It took $250,000 from the Walton family in 2011 alone. Tindley even got start-up money from the Bill Gates-funded CELL. When Bill Gates’ so-called “researcher” visited Tindley, Peterson’s office was happy to write that Gates’ representative, after witnessing the school’s female-male classroom segregation, “noted that she had never seen so many female students who were unafraid to participate, debate, discuss, and question openly in a math class” (10). The 2011 audit for the Andrew J. Brown Academy cited concerns with oversight of the school’s management contract with NHA, financial reporting, federal grants, cash receipts and more. It also noted there were no records to support enrollment claims made by the charter school on its September count date, which is used to determine tuition support provided by taxpayers. In its audit response, the education management company disagreed with most of the findings, but agreed to provide “more detailed quarterly income statements and invoices” to support money paid by the school to NHA. By “subleasing buildings to public charter boards at as much as 1,000 percent markup,” National Heritage Academies profits from working at 74 different locations across the U.S. It was John Engler, then-Michigan governor, who helped the NHA proliferate. Engler is the former president of the National Association of Manufacturers, past chairman of the National Governors’ Association, and former co-chair of Achieve, Inc., one of the groups behind Bill Gates’ Common Core initiative. Engler’s Annie E. Casey Foundation has played a part in Indiana, too. Run by past UPS-Lilly tycoons, the Annie E. Casey Foundation (AECF), in April 2005, announced with then-mayor Peterson the Indianapolis/AECF partnership with the Bond Bank, the Local Initiatives Support Corporation (LISC), and Bank One to offer low-rate loans of up to $20 million to charter schools in the city. To the Indianapolis Charter Schools Facilities Fund, a loan program which operated from 2005 to 2009, AECF added $1 million, as did the Local Initiatives Support Corporation, but only if public funding through the charter schools didn’t pan out and the schools went into default. With overwhelming praise for Bart Peterson, and profits for Bank One, the AECF outlined the plan so that, with help from the U.S. Department of Education, no one but the public, who fund these charter schools through taxes, and/or any private companies who donated to these charter schools, would lose money (see pages 10-12, in-text). Ballard and Peterson like to compare Indy to New Orleans any chance they get, and suggest that local communities, under the Mind Trust plan, will be able to start their own teacher-student-community friendly charter schools, but this is not how it works. The corporate school complex in New Orleans has done everything possible to rid its city of charter schools that are not out to profit. Indianapolis is going to work the same way. The media, the mayor’s office, the state, and the mega-rich have all their forces in line. Not only will they dictate what tests your kids take and what schools they attend, they will say who gets the money in the process. The only people who have real choice in the school choice movement are the people with the money. This K-8 mayor-supported charter school occupies formerly vacant space in the old National Car Factory in the Martindale-Brightwood neighborhood and is filling an educational void in the near northside. The Project School is dedicated to educating the whole child with project-based learning. Projects include Project Endure, a not-for-profit creation of the Project School’s Tarrey Banks, where 8th-12th graders are taken on annual adventure treks. Project School partners with a myriad of organizations: Center for Urban Ecology, Big City Farms, Growing Places Indy, Indy’s Kitchen and People for Urban Progress – just to name a few! ** After Harris’ comments on how TPS should be closed, Peggy Robertson, from Opt Out’s national office posted a response on her blog which included comments from Indiana Artist Program’s John Sherman who had spent time at TPS teaching poetry. It is worth reading. ** Beth Bray says that both Smith-Jones and Vane have agreed to volunteer their time spent directing TPS students, but the mayor’s office is in negotiations with Vane to pay him for future work he is going to do concerning charter schools with the mayor’s office. †Pearson has just acquired Bloomington, Indiana’s Author Solutions. Fact Check: How are your “Facts” represented in your comment? As they are not, perhaps you’d like delineate each point more thoroughly with pertinent verifiable detail. If not, your comment is meaningless other than as agitprop. Doug’s piece works very hard to show you how one does research and offers evidence. Pay attention. Tindley also removes it’s bad test takers (many of whom ended up at the Project School) using dubious means, as well as bullies its students and staff. You should also check out it’s finances. Much shadier than the Project School, and no call to fix them. It is always a crutch for the weak to point at others and suggest that they are worse. Tindley makes leaders for those willing to work. Those who aren’t don’t survive the culture. That is a far cry from having a white staff that is unable to deal with black students. I’ve heard nothing but deflection from TPS. No ownership for years of horrid performance. And if I wanted to create a manual on how not to react, I’d have followed every step TPS staff and parents have taken. The powers-at-be are also happy to listen when your collective community resorts to senseless behavior and meaningless graphs. It doesn’t go unnoticed that TPS has recruitment signs at white enclaves like the Winter Farmers Market and Mass Ave., while not making efforts in its own community. TPS has used the people of Martindale-Brightwood. They won’t be unhappy. Again, you make claims and are showing yourself simply a propagandist and ideologue. You make two points only: 1. The weak are weak–screw ‘em. (By the way, Jesus is the God of the Weak.) And 2. Tindley trains workers. That is the full force of your groundless opinion. Ultimately though, you are only expressing the Leader’s mantra. You offer the lesson of the bully only. Look around you at the “surviving” bully culture. You too will be trampled under foot. We shall suffer alike but not together. It appears as if the Tindley motto is “College or Die.” What’s up with that? This is precisely the kind of pseudo-meritocratic propaganda that charter management organizations sell to low-income communities. Emblazon the walls with catchy slogans and force them to play dress up by wearing country club blazers. Actually, when you skim the handbook, talk about the white achievement mentality peeking through here: no “doo-rags,” “rat tail combs,” and heaven forbid, “sunglasses?” The curriculum is also imperialist in nature, that the white curricular canon comes at the expense of a more diverse subject matter. Students are not likely to see themselves in a curriculum dominated by Western Civilizations, American History, and Philosophy. Look, the manifesto of Tindely reads like any other school for inner city youth (read Black) organized by a Board of Directors from the business community. No educators on the Board. And no less, the head of school is called a CEO. This is the reality of the prison/school culture of class and race bigotry enforced by the “invisible hand” of the White God. Stand for Children exposed the true 30% graduation rate of Tinley. TPS had a 100% passing rate of both Math & ELA of it’s 4th graders who had been there for 3 years…that’s statistically proven and relevant results, even on an unethical assessment. TPS does have a diverse staff and because of it won a Cultural Diversity Award. Tinley only recruits and retains college bound students. TPS values diversity and allows any student to come and excel, therefore, the TPS recruitment is from any neighborhood, but doesn’t restrict any students from attending. So the real issue here is valuing of human beings as diverse individuals with different contributions to our society. Talking about valuing of human beings, let me ask you this question? Is the result Tinley is looking for an increase in teen suicides for those who don’t have the aptitude for college? If not, the why are four foot high letters on the school’s main entrance hallway and the hall students walk down every day spelling and yelling out out “COLLEGE OR DIE!” That is just child abuse. Fact Check, where is your transparency or is that a real name? What is this about no ownership? Who are “the-powers-that-be”? Please tell me, I would love to talk with them. Also, have you actually been to the school? You are sharing info about another school; where is your compare/contrast from real life experience? I can talk all day about what it is like to climb a mountain; however, until I do climb a mountain that is all it is; talk. Please note: families; of varying races are standing up to counter what has been put forth; isn’t that what people are encouraged to do? Standing up for one believes in is a cornerstone reason for my decision to chose TPS. This school encourages students to learn, think, and take action for self and community; be it the micro-community or larger area. TPS is multi-cultural and that is one reason I love it. I am Urban Indianapolis, in that I was born and raised here. I grew up in the projects and low income neighborhoods all over this city and went to IPS. I don’t want my children, or any child to walk in my footsteps. I want more for our future, and that doesn’t include allowing people to hide behind a cyber-wall pointing a nameless finger. It also does not include me not standing up for fear of sounding stupid; Because at the end of this I will have done what I could to stand for my family, and community. I loved that Martindale-Brightwood area had such a fantastic opportunity for the citizens open up there; please note that this is not the only Project School. I am a 40 yr old woman, going to school full time, and have two wonderful daughters. I did the research, I visited the schools, and I don’t follow standardized scores. I comprehend the need for such for the status quo and since I understand how easy it is to skew data that would never be in the forefront of my decision making. Wow, no wonder the world is bleak in some places. Good, I am further pleased to have TPS, we will take your castoff children and love them, we will support them in who they are as people and when they grow-up, they will know that their education was created through passion of knowledge, and passion of education. Sustainability and an inclusive culture; room for all. Mr. Martin, thank you for your article. when the teachers, parents, and students are willing to stick their necks out to FIGHT to save their school, I think it’s pretty clear (even pseudo data culled by profiteering “non profits” to crunching doctored numbers needed to refute…) that this is a school that WORKS. The agenda of those fighting to keep their community schools has nothing to do with profit and political gain-the same cannot be said of those pushing public and community school OUT. This is not rocket science folks. Don’t let policy makers stall or confuse you with anything other than common sense. TPS will not go down quietly-nor should it. Behind TPS is a few thousand people nation-wide all with their eyes now closely on Indiana-Small school? Maybe-but more people backing them than the reformers or their cronies are prepared to deal with.